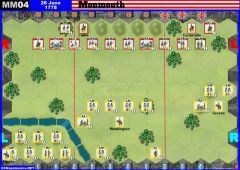 Wellington’s victorious army was too tired to give immediate chase to the defeated French after the Battle of Orthez, but Wellington did dispatch General Hill with two divisions of infantry, a cavalry brigade and horse artillery to deny the French time to regroup. Hill caught up with General Clausel’s rear guard at Aire. Marshall Soult ordered Clausel, with two divisions, to hold Aire long enough to allow Soult’s artillery stores and ammunition to be moved out of harm’s way. 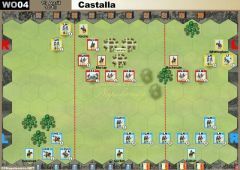 The battle opened with the Portuguese assailing the center and left of the French line. 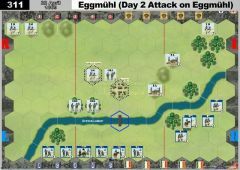 These attacks were met with a bayonet counter-charge that sent the Portuguese back toward the Grave River. 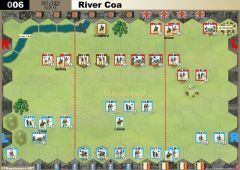 Stewart’s advancing British reinforced Da Costa’s men and halted their retreat. The Portuguese and the British reinforcements stormed up the ridge a second time and hurled the French back. 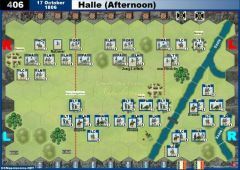 Aire was captured and the French stores became Hill’s prize. The River Grave can be forded not only at the ford terrain hex, but in all other hexes as well. 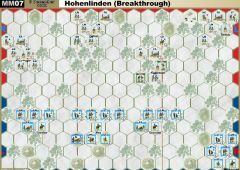 However, when crossing the ford terrain hex, a unit or leader does not cease movement (the ford terrain hex represents a low water crossing point). 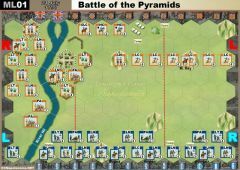 Defeated my wife 6 - 2 as the British, after her Bayonet Charge killed one block with 4 connecting infantry units and I copied her card, really hitting home. She didn't get disheartened though and defeated me 6 - 1 on Vimiero on the next day. Boy did we get some weird results this week. We managed to get in six games and five of them were blowouts. Also the French won four of the six games. The wildest was the last game we played that was a British Victory. I was commanding the French. For the first time the Portuguese successfully mounted a full scale assault on the French center and annihilated it. 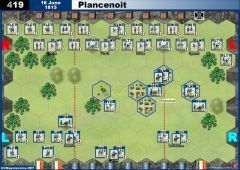 When the game ended there was only one French Unit left in the center. We are really getting used to this. Between four of us alternating, we played it nine (9) times today!!! Final tally: French 5 victories; English 4. We are getting so used to this scenario we managed to get off six games tonight. Final tally 3-3. In four of the games the final scores were 6 banners to 5. We have played the last four scenarios (We started with Waterloo and are working our way backwards). So far we think that this is the most interesting scenario we have played so far. Thanks, your corrections look great. FYI. My regular CCN partner and I have played this scenario six times. For us it is a very balanced scenario. Both sides have one it three times. In four of the games the final score was six banners to five. 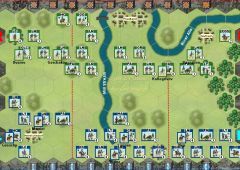 One of the features of the C&C series that we like is that one can play a game several times in one session. Last Friday we played this particular scenarion three times in one evening. Everything should be fixed right now. 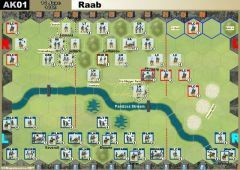 “Combat at Aire” is a Base Game Official Scenario. We have discovered three errors in the directions for the scenario here. 1. 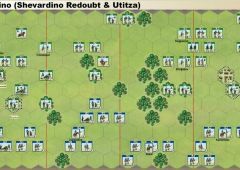 Map: The Portuguese unit in the top row, four (4) hexes from the left should be a LC not a HC. 2. 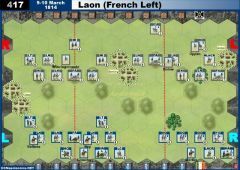 Map: The French unit in the third row, five (5) hexes from the right should be a LT not a LI. 3. Portuguese order of battle: There should be two (2) Portuguese leaders, not one (1).